The holidays are a natural breeder for mom guilt. Really any busy season is but there’s something about the Thanksgiving and Christmas season that seems to grow mom guilt at an alarming rate. The number of activities available to over-commit to, the pressure to make the season magical, the financial burdens, the family gatherings, and the list goes on and on. There’s always something you will feel like you aren’t doing enough of during the holidays. There will always be the fear that you are letting someone down. There’s always something to guilt yourself about. Whether you are in a season where finances are tight or there is more than enough to go around, finances are always a potential source of guilt. Especially in a time when you are expected to buy a million and one Christmas gifts. Obviously there are the gifts for your kids and husband, but then you bring in both extended families. And it always happens that at least one friend gives you a gift; so then you need to give one back. And possibly the neighbors. And the kids’ teachers. And all of the white elephant games you will inevitably play at every christmas party. And maybe even your husband’s boss or coworkers. The list could just keep growing. That is, if you let it grow. This is where you need to decide on a boundary. Creating a budget with your husband is the best place to start. Talk about who to buy for and decide on a dollar limit. Maybe you even decide to chat with extended families and choose to stop exchanging gifts with them. Or you draw names and only have to buy for one or two of them instead of all of them. My family does this. Around October every year, we write out my and my siblings names on paper. Then we each draw a name out of the hat. You are only expected to get a gift for that sibling. As our family grows with each marriage, this helps eliminate some of the financial strain to buy so many gifts. Christmas gifts also don’t have to be bought. In a season where everything is bought, it can be extremely thoughtful to make a Christmas gift or do something out of the normal. Last year, I decided to make a few hand lettered pallet signs for my family instead of buying gifts. Since we had just moved to Maryland from Colorado and were planning on flying back to Colorado for Christmas, funds were extremely tight. I found some free pallets on Craigslist, bought a five dollar can of stain and some paints from Walmart, and went to work. You can find plenty of tutorials on Pinterest and YouTube for pallet signs and inspiration. It was a ton of work (pallets take FOREVER to sand) but it helped our finances out a lot. Just remember, if you are traveling to give this gift, make sure to measure the suitcase it will be carried in before deciding on the dimensions of your sign. It would be so sad to go through the work of making a beautiful gift and then not be able to take it with you. Christmas gifts can also be food, especially for friends or neighbors you feel like you need to give a gift to. A lovely array of home-baked Christmas cookies or some nice creamy fudge are always welcome gifts and won’t take a huge chunk out of your Christmas budget! I feel like most moms have commitment guilt most of the year, but when the holidays roll around, the need to help out at every single event grows a thousand times over. All of the Christmas parties need to be attended, the kids have a thousand events at school that need parent volunteers, the need to take the littlest ones to the mall to see Santa, all of the holiday crafts that other mom is doing with her kids, and the commitments just keep piling on. And on top of it all, your normal mom duties don’t just magically go away during all of this. I’m someone who over commits super easily. I love being involved and feeling needed. And I also get overwhelmed easily. Slowly over the years, I’ve learned to commit to only one thing at a time. I then give it a week or two before committing to something else. This allows me to ease into things and not suddenly have every single night of the week scheduled down to the minute. Another way to keep your over committing in check would be to designate a few nights a week to activities and a few others to no activities and stick to it. Maybe you are willing to do things on Tuesday, Friday and Saturday but keep the other nights free to be at home as a family. Or you could choose a number of nights per week that you and your family can be busy. Maybe four nights a week you are fine with activities and it changes every week what those nights are. Once you hit four for the week, you block off those other three nights as non-activity nights. I would suggest to start trying this out now so you know what works for you and your family when the height of holiday bustle hits. If you look on Pinterest, there are a million different advent calendars, crafts, bible reading schedules, and ideas to help remember the true reason for Christmas. These are great ideas and there is nothing wrong with them. They just tend to make moms feel like they aren’t doing enough. We fall into the mentality that if all of that exists, it means that someone is out there doing all of it. And if we aren’t, we are failing as a mom. THIS IS NOT TRUE!! Yes, some mom out there is probably doing 4 different advents with her kids, reading 5 different scriptures with them every day, and has a craft to go with each one. But that doesn’t have to be you. And if it’s not you, it doesn’t make you a worse mom than her. The point of Christmas is that Jesus came down to be with us because he loves us. Not that you must do every advent program out there. Maybe choose one advent to do. Maybe choose none and decide to make a conscious effort to just talk with your kids about Christ instead. There’s no list in the bible of activities that have to be done leading up to Christmas. Take on what you can handle and try to not compare to other moms. This is the biggie. How do you figure out how to split your time between the extended families and your family? How do you make sure everyone is happy and getting the time that they want? How do you not offend anyone when you say no? The first step is to accept the fact that you can’t make everyone happy. So you are going to have to choose your priorities as a family. Every year, my husband and I sit down and figure out the plan, just the two of us. Ahead of time we will talk to our families individually and see what their plans are. Then when we sit down to talk about it, we can go through what activities we are going to do with each family. We are fortunate enough to have both families in the same city. This does mean we do quite a bit of driving back and forth on Christmas, but it also means we both get to see our families on Christmas day. Once we come up with our plan, we let the families know and stick to it. We know we are going to miss some things and that someone may be disappointed that we weren’t there for something, but that’s just the way it goes sometimes. The main thing is that my husband and I are on the same page. We are a united front and have made each other our priority. Lastly, I would suggest writing down what you decided on. The craziness of the holidays has a way of making you forget plans. This way you also can look back on it in future years and remember if it worked or if you need to change it up. Christmas is supposed to be magical right? The twinkling lights everywhere, the smell of snow in the air, the gifts around the tree, and the Christmas music playing all add up to magic. Yet, as a mom, we feel the need to make Christmas magical for our kids. We think this means dressing our house to the tee with decorations, doing all of the activities, adding all of the special Christmas traditions, and somehow making magic. We’ve missed the point of magic though. It’s not this huge grand thing. It’s in the little special things we do throughout the season. As a kid, I loved to bake with my mom. So the magic of Christmas was getting to help her make a million cookies to take to our neighbors. I loved (and still love) Christmas lights and decorations, so the garlands with lights that my mom hung on the banisters were magic. Lighting the white candle on Christmas day was magic. Decorating the Christmas tree as a family was magic. Kids don’t care so much about the huge events, they care about quality time spent with their family. All of these things we do to try to create magic aren’t necessary. Make Christmas magical by spending intentional time with your kids. Maybe choose one new tradition to start instead of trying to add all ten that you researched. Research a craft together with your kids then do it together. Let your kids help you decorate the house. We don’t have to make magic, we just have to prioritize our family. That will make the magic. 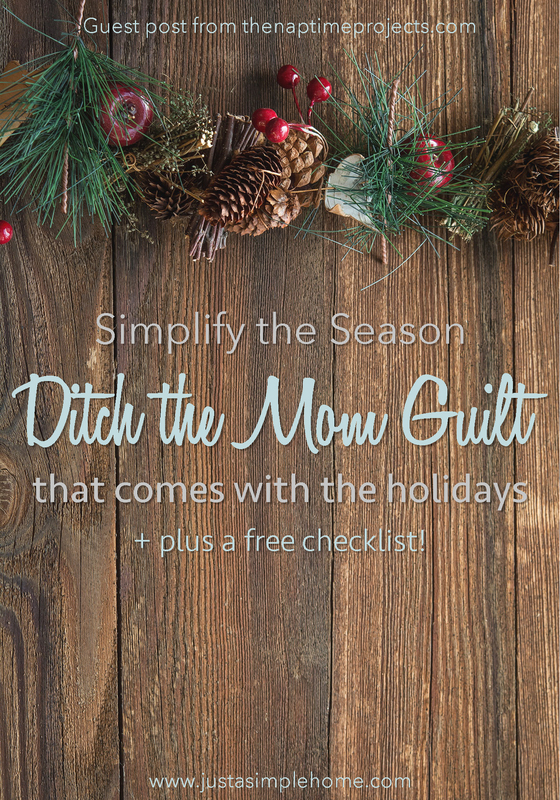 To help you ditch the mom guilt this holiday season, I’ve created a checklist for you to print! Put it in a place that you see regularly to remind you that you don’t have to do it all this Christmas! Click HERE to download your FREE CHECKLIST! What are ways you ditch the mom guilt? Tell me in the comments below! Rachel Harrell runs The Naptime Projects, a blog dedicated to end the superiority in motherhood and helping moms take back their life one naptime at a time. 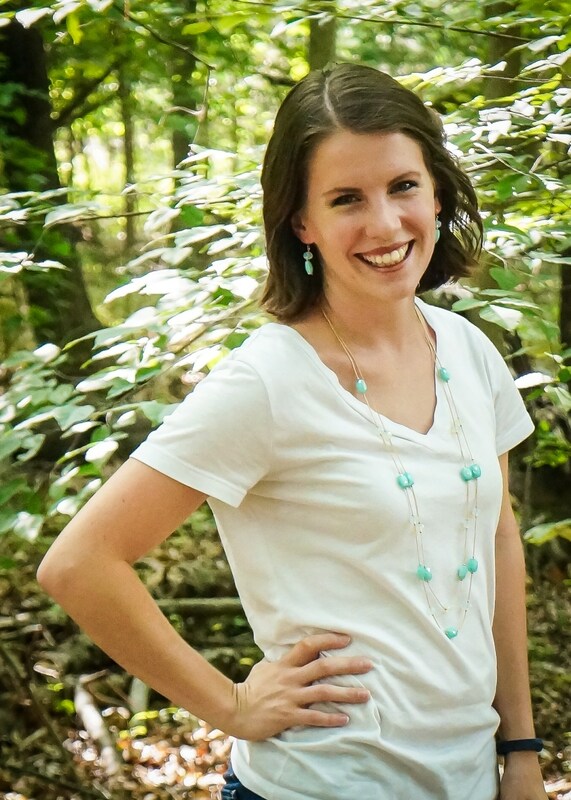 She enjoys building things from pallets, date nights with her husband, Chris, and playing with her little boy, Will. If you keep everything simple and focus on your family and let everyone else know these are your plans and stick to it. Don’t let them guilt you.